If you have a Game Stores gift card, you can check your balance instantly online at this page: click here. Game Retail is a major retailer of console games and systems including VR systems with stores across the UK and Spain. You can find your nearest Game store here. As a gaming specialist, there are a first port of call for all ardent gaming fans whether Nintendo, Playstation, XBOX or PC. Their staff are pretty much all hardened gamers themselves, so you can always get good up-to-the-minute advice from them. As you’d expect from a technology retailer, they also have a great website where an even wider range of products are stocked. 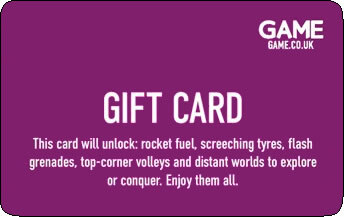 The Game Gift card is a useful gift to give to anyone that’s into games because they’re sure to be able to find what they want at Game, even if you don’t know what that is! Where can I check my Game Gift Card Balance? You can check your Game Gift Card Balance online by clicking here (scroll down the screen – balance checker is at the bottom of the page. You can check your Game Gift Card Balance by taking the card into any Game store. Click here for your nearest Game store. Where can I buy a Game gift card from? You can purchase a Game gift card for yourself or to give as a gift directly from the Game Website, here. Game Gift Cards can also be found in other high street retailers, including Tesco. Where can I spend my Game gift card? The card is welcomed at any Game Store – click here for your nearest. The card can also be used online at the Game website (note: there is a limit of 3 gift cards per transaction).